The Convening Committee for the All Pakistan Students’ Convention, formed by the Inter-Collegiate Body decided to send a delegation of four persons to tour important towns of West Pakistan to mobilize support for the convention, to be held in the month of July. Amongst the members of the delegation were Syed Iqbal Ahmed, (VP, SM College), Moizuddin Farooqui, (GS, Urdu College) and Khwaja Adil Ahmed, (GS Law College) and myself. Our programme was to pay short visits to Multan, Lahore, Rawalpindi, Peshawar and Hyderabad. After reaching Lahore we had to accept the forcing invitation of Lyallpur students to visit their city also. Finally that our tour was being financed by Mian Iftikhar-ud-Din. These were very fantastic allegations indeed. We were wondering if anyone could have dared to say such things about us in Karachi, where students know us better than anywhere else, and if true, these charges should have been leveled against us by Karachi students much earlier. Incidentally Mr. Israr, Nazim-e-Ala Islami Jamiat-e-Tuleba had arrived in Multan two days earlier and was seen distributing these handbills himself. That night we had the honour of performing the opening ceremony of the Nishtar Medical College Hostel after which we dined with the students and staff of that college. After the dinner I addressed the gathering and conveyed to them the message, the feelings and sentiments of Karachi students, to which they responded with equal warmth. The next day another meeting of the students was arranged on the playground of the Emerson College. At this meeting we replied to charges that were leveled against us by the Islami Jami-at-e-Tuleba in their handbill, which however, they had not the courage to print in their own name. After our explanation the students got infuriated and demand an unconditional apology from the three Jamiat people present at the meeting who were about all they had in Multan. Of course they could always bank upon the aid of their mother party and perhaps foreign aid as is widely believed (sic) the Jamat Islami. The students said that these mullas had insulted student community of Multan by insulting their guests and unless they tendered unqualified apologies they would be handled severely. The poor Mullas who had dared all this on the instructions from top, in the presence of their top most leader were put in a very awkward position. Obviously they had miscalculated to a great extent. However, we intervened and the ‘Mullas’ fled, but we could not save their 200 copies of the ‘Students’ Voice’ which were torn to pieces and burnt by the students. We could not save the organ of the IJT as the anger of the students knew no bounds for which the Jamiat leaders had to thank themselves. Late in the evening a meeting of active student workers was held where they resolved to form the Multan Students’ Federation which would organize the students of Multan to defend their own rights and prepare for the convention. 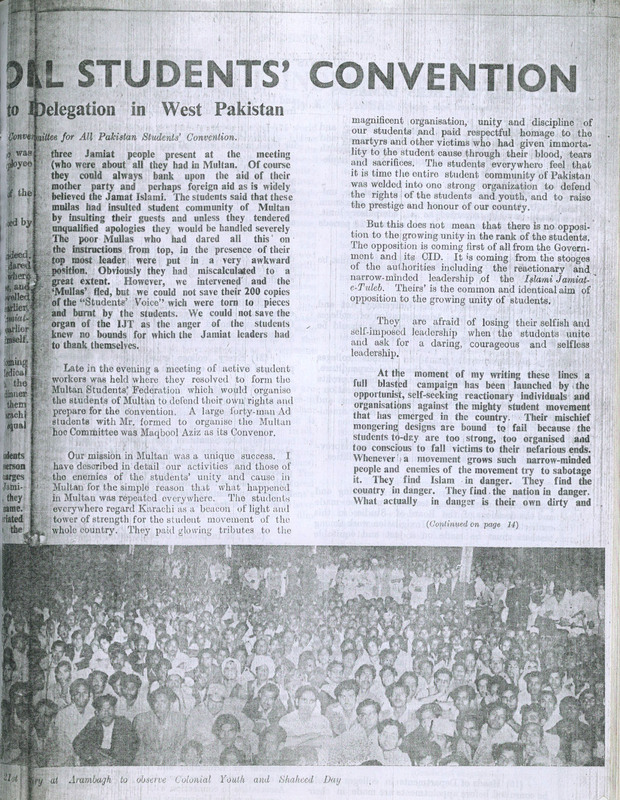 A large forty-man Ad hoc Committee was formed with Mr. Maqbool Aziz as its Convenor to organize the Multan students. Our mission in Multan was a unique success. I have described in detail our activities and those of the enemies of the students’ unity and cause in Multan for the simple reason that what happened in Multan was repeated everywhere. The students everywhere regard Karachi as a beacon of light and tower of strength for the student movement of the whole country. They paid glowing tributes to the magnificent organization, unity and discipline of our students and paid respectful homage to the martyrs and other victims who had given immortality to the student cause through their blood, tears and sacrifices. The students everywhere feel that it is time the entire student community of Pakistan was welded into one strong organization to defend the rights of the students and youth, and to raise the prestige and honour of our country. But this does not mean that there is no opposition to the growing unity in the rank of the students. The opposition is coming first of all from the Government and its CID. It is coming from the stooges of the authorities including the reactionary and narrow-minded leadership of the Islami Jamiat-e-Tuleba. Their’s is the common and identical aim of opposition to the growing unity of students. They are afraid of losing their selfish and self-imposed leadership when the students unite and ask for a daring, courageous and selfless leadership. At the moment of my writing these lines a full blasted campaign has been launched by the opportunist, self-seeking reactionary individuals and organizations against the mighty student movement that has emerged in the country. Their mischief mongering designs are bound to fail because the students to-day are too strong, too organized and too conscious to fall victims to their nefarious ends. Whenever a movement grows such narrow-minded people and enemies of the movement try to sabotage it. They find Islam in danger. They find the country in danger. They find the nation in danger. What actually in danger is their own dirty and selfish leadership. The students of Pakistan and particularly of Karachi know it too well that there are some stooges of the authorities and the Islami Jamiat-e-Tuleba who have always betrayed the students’ cause, who have stabbed the student movement in the back, who have given a satanic laughter at the blood and tears of the people who braved the worst police terror while upholding the students’ cause. And now these traitors come forward as champions of Islam and find Islam being ousted from Pakistan. Their names and the language they speak is familiar to us ­– it was heard by us in Government communiqués issued during our January struggle and in Chief Commissioner Naqvi’s statements. The students have already given their reply to them. Continuing my story of the tour, we left Multan for Lahore on the 20th. We were satisfied with our work in Multan and were happy and inspired. In Lahore we were given a very friendly and cordial welcome. We met the office-bearers of the Muslim Students’ Federation, Democratic Students’ Federation, Lahore College Unions’ Organisation, etc. They all extended to us their fullest co-operation for the convention. We visited practically every college of Lahore. We had discussions with the general students and found them to have as much interest in Karachi affairs as we ourselves had. We held group discussions and explained our aim in coming to Lahore and about the convention. From every quarter we heard the same thing. “We must have an All Pakistan Organisation for students.” “We congratulate you for taking the initiative in this matter.” But again a love cry was heard in the wilderness: “Brothers in Islam, don’t listen to them. They want to make you communists. Como hide yourself behind us and save your soul”. As in Karachi and in Multan these voices belonged to the most backward and reactionary mullas and the students knew them well. Time had passed long ago when every movement could be curbed-after labeling it as communist. People are no longer scared by the false alarm raised by the disruptionists. They see who is who and what is what. Satisfied with our mission’s success and with full faith in the consciousness of Lahore students and assured of the miserable failure of the enemies of the student movement we bade goodbye to our innumerable friends in Lahore. We reached Rawalpindi on the 26th. It is a fine city but has only two colleges. The students of the Gorden College, an old fortress of the student movement have been deprived of their right to organize. 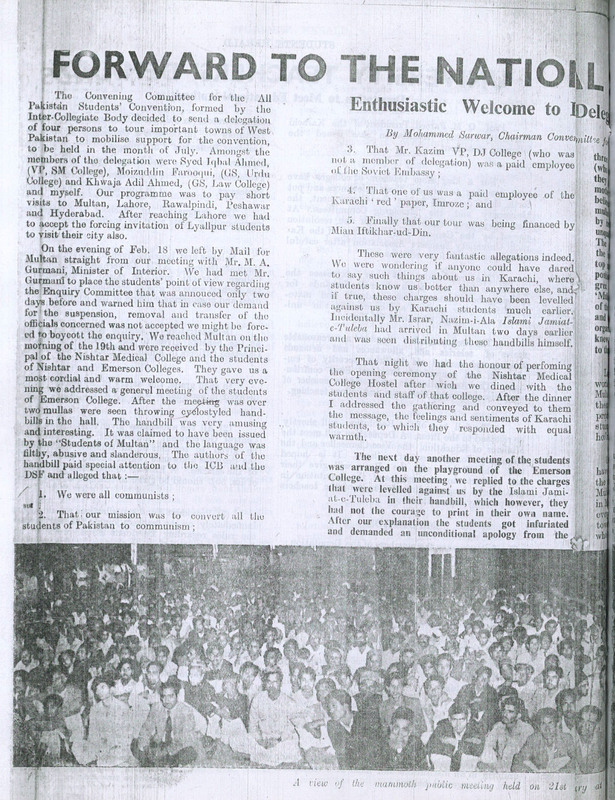 But the student of this College have a fine tradition of independent views and strong student movement. At the present moment they have formed a Union of their own and most of the students of Gordon College have become members of the Union. They are struggling for the recognition of their College Union. We addressed a meeting of the ‘Gordon College Union members. The Union assured us of its unstinted support for the convention. In the Government College some trouble is brewing between the authorities and the Union. When we went to the Government College we found an unholy alliance between the goondas and the Islami Jamiat-e-Tulaba. The same hackneyed questions which had been circulated from their headquarters were asked. The students were fully satisfied with our answers. But the goonda-mulla axis would not admit defeat. They started shouting and stone-throwing. And asked the students to disperse from the meeting. But they have as much ‘influence’ here as elsewhere. The meeting went on inspite of their attempts to create pandemonium. In the meantime the principal arrived and just as the rats flee with the appearance of a cat so did our Islamic stalwarts fly before him. What courage we thought! In the evening a meeting of all the good workers of both the colleges was held. They decided to go ahead and organize the Rawalpindi Students’ Federation. This Federation has a very bright future. They have a number and quality of workers on which any organization could be really proud of. Back in Karachi we heard a few mullas say that we had failed in our mission. We had heard of white lie. But these mullas, the monopolists of Islam had gone a step futher ahead. Goebbels must be satisfied that some one has replaced him. What is your opinion about the Pakistani people’s beloved organization, the Jamiat-e-Islami? What is your opinion about the Qadianis? What is your attitude towards Islam? Were the methods adopted by the ICB to get their demand accepted better than those adopted by the Islami Jamiat-e-Tulaba in getting the degree of the Dow Medical College recognized? I happen to be the Vice-President of this particular College Union and I know it for certain that out of the 650 students in my college only 2 belong to this organization which boasts having got our degree recognized! The Lyallpur Students’ Federation is a powerful organization and the Lyallpur students are forging a lasting unity. It was an inspiring experience to go there and see for oneself the students working for the cause that is common and dear to all of us. In the Frontier Province the students gave a hearty welcome to our delegates. They extended the traditional Pathan hospitality to the student representatives of Karachi. There they have formed the Sarhad Students’ Federation which enjoys the confidence and love of all the students of the NWFP. In every college they have a unit of their own. The Frontier students gave whole-hearted co-operation to the convention. Some misguided mullas again tried to create disruption in Peshawar and they were literally thrown out of the Islamia College. This, in short, is the outcome of our short visit to five important cities of West Pakistan. We are going to Hyderabad Sind in the near future. Back in Karachi we have seen that a conspiracy is being hatched to disrupt the unity in the student ranks and check the rising tempo of the movement. An organized attempt is being made by the enemies of the student movement to turn the clock back. But fortunately, the people who are planning the conspiracy have already been exposed thoroughly before the general mass of the student community. As a last resort they have taken shelter behind religion and started communist bogey. But will the students fall a prey to these designs? I am convinced that this dirty plot will fail, as did the plot of the Government two months ago. There is no difference between the two plots and their result will be the same. We must start preparations for the Convention which is to be held in July. On the success of the Convention will depend the future of the student community? Already we have achieved much but much still remains to be achieved. Unity is the only weapon which we have and we must use it to the best of our interests. From every part of the country large number of delegates will come and organize a mighty and powerful All Pakistan Students’ Organisation which shall lead the youth of the country towards a brighter and happier future. FORWARD TO THE CONVENTION! LONG LIVE STUDENTS’ UNITY! DOWN WITH THE TRAITORS AND DISRUPTIONISTS!